Reinforced 10 gauge moldboard design: Provides added strength and durability. Choice of 60", 72", 84" or 96" working widths: Allows customers to choose the blade that meets their operational needs. Double-acting angling cylinders (dual): Easily enables up to 30 degrees of angling to left or right distributing the load where you want it to go. Trip design with springs: Protects the structural integrity of the blade while still maintaining load control no matter what the bottom edge encounters. Easy-attaching mounting system: Adapted for tractor loaders with quick-attach front mounting plates. Replaceable bottom wear edge: Offered in steel or heavy-duty poly construction to match ground & surface operating conditions. Skid shoes: Offered as standard equipment. Establish lower limits of blade operation to prevent surface gouging or cutting too deep. Also provides protection to the moldboard as cutting edge wears. Blade marker: Provides operator with improved awareness and visibility of outermost edges of the blade bottom to prevent unwanted contact with ground obstacles. 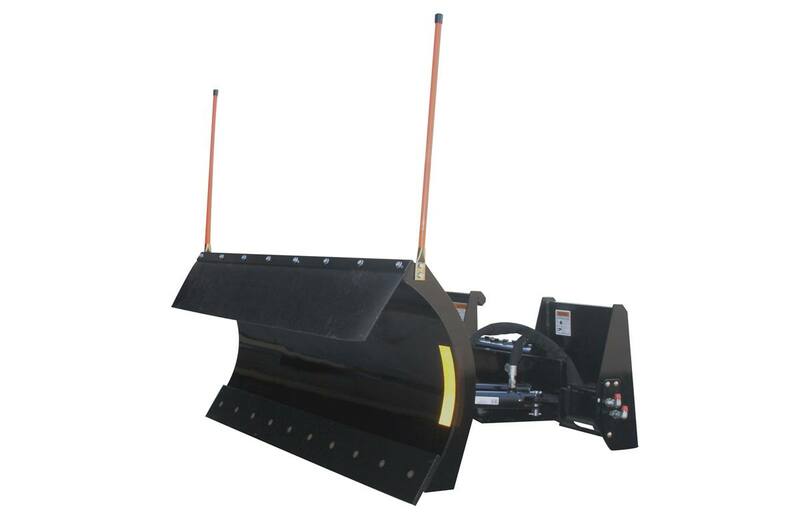 Optional top mounted rubber deflector: Helps prevent snow from over-topping the moldboard in deeper snow conditions. Side float: Allows the blade to follow the ground contour. Locking system: Allows for light blading. Cushion valve: Helps protect the moldboard and cylinders in the event an obstruction is hit, by allowing hydraulic fluid to bypass the cushion valve and flow back to the tractor. Blade Width (Maximum Cutting Width): 72"
Cutting Width @ 30o Angle: 62 3/8"
With Steel Cutting Edge: 616 lb. ; With Poly Cutting Edge: 629 lb.